Two clear title favorites top our rankings, but another 10-12 teams could win the whole thing. Eight more days until we can quit with all the projections and finally watch some hoops. Despite the FBI investigation hanging over the sport, the 2017-18 season shapes up to have plenty of thrills with a pair of clear title favorites in Arizona and Duke, but another 10-12 teams that could win the whole thing. Here’s a look at the top 25 teams in college basketball this season. Arizona has a loaded roster led by National Player of the Year contender Allonzo Trier, a 6’5″ junior who averaged 17.2 points last season. He, sophomore Rawle Alkins and senior Parker Jackson-Cartwright constitute a dominant backcourt, while UNC Asheville transfer Dylan Smith will provide an additional perimeter threat off the bench. We’ll see if Alkins, who broke his foot in late September, returns in time for key non-conference matchups against Texas A&M and Alabama. Top-40 recruit Brandon Randolph is the frontrunner to start the season in his place. As good as the backcourt is, Arizona’s best player is on the front line in freshman center DeAndre Ayton, who’s in the No. 1 pick conversation for the 2018 NBA Draft. He’s young, but he’s skilled enough to efficiently average a double-double this season. A close second to Arizona, Duke welcomes the nation’s No. 1 recruiting class, led by power forward Marvin Bagley. 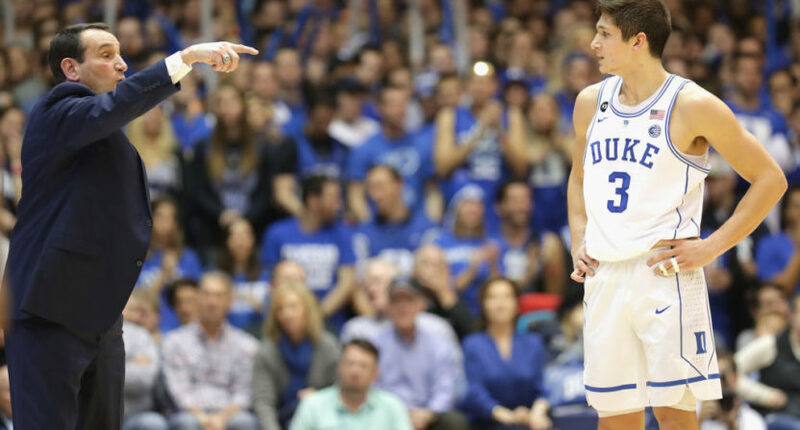 The Blue Devils will rely heavily on their four five-stars to contribute in major ways immediately with only one player from last year’s rotation returning. That one player is, of course, senior guard Grayson Allen. Allen has a chance to redeem himself with a second national title after a disappointing junior year. With their entire rotation returning, the Shockers bring back more production than any KenPom top 10 team from last year. The downside for Wichita State is injuries, as we’ve heard before. Sophomore point guard Landry Shamet had foot surgery over the summer and still was not practicing as of earlier this week. Junior forward Markis McDuffie will be out until about mid-December with a stress fracture in his foot. Those are Wichita State’s two best players, and those injuries could affect key non-conference games against Baylor, Oklahoma State and Oklahoma. Fortunately, the Shockers will have opportunities in conference play for quality wins now that they’ve moved from the MVC to the AAC. This is a guard’s game, and Kansas is loaded with perimeter threats. Devonte’ Graham steps into Frank Mason’s role as the lead and could realistically follow Mason as a National Player of the Year. He’s surrounded by three awesome shooters in Mississippi State transfer Malik Newman, senior Sviatoslav Mykhailiuk and junior LaGerald Vick. If Kansas doesn’t live up to its top-four billing, it will because of issues in the frontcourt. Udoka Azubuike played only 11 games as a freshman due to a wrist injury. He’ll start at the five with five-star Billy Preston playing the four. Bill Self’s last two five-star big men — Cliff Alexander and Cheick Diallo — were non-factors as freshmen, although Azubuike was off to a better start last year before his injury. But don’t doubt Self. Kansas has won 13 straight Big 12 titles and been a top-two seed in the NCAA Tournament each of the last eight seasons. Self has eight straight seasons as a top-two seed, and Jay Wright is the next best in D1 with four. After bowing out in the second round of last year’s tournament, the Wildcats are national title contenders once again thanks mainly to junior point guard Jalen Brunson. Brunson averaged 14.7 points with a 60.4 eFG% and 26.1 assist rate. Now he’s “the guy” for Villanova with Josh Hart and 2016 national championship game hero Kris Jenkins graduating. Michigan State has the National Player of the Year frontrunner in Miles Bridges, but remember that the Spartans weren’t all that great even when Bridges was healthy last year, going 10-10 with their only road win coming against Nebraska. But Bridges, Nick Ward, Joshua Langford and Kenny Goins are all a year older, and they’ve got a senior leader in point guard Lourawls Nairn Jr. Meanwhile, the frontcourt gets even deeper with senior Gavin Schilling back after a redshirt and five-star recruit Jaren Jackson Jr.
It’s pretty much a whole new cast for Kentucky in 2017-18. They have three returning players who combined for only 826 total minutes. Wenyen Gabriel, the only of those three to appear in more than 15 games, should get a starting nod, but that’s only because five-star freshman Jarred Vanderbilt is out until January with a foot injury. Even with Vanderbilt missing time, his fellow five-stars, led by Hamidou Diallo, who nearly went pro after last season, and Kevin Knox give Kentucky enough firepower to win the SEC. As consistent as Cincinnati has been under Mick Cronin, it’s astounding the Bearcats have made only one Sweet 16. It’ll be a huge disappointment if they don’t add a second this spring. Offense has consistently held the Bearcats back, even though they’re always one of the nation’s best defensive teams. Cronin could have his best offensive team yet with juniors Jacob Evans and Cane Broome paving the way for a high-scoring backcourt. Evans led the team with 13.5 points and 41.8 3-point shooting last year. Broome, a Sacred Heart transfer, averaged 23.1 points there two years ago. Cincinnati also has an experienced frontcourt with seniors Gary Clark and Kyle Washington, two-way players who each averaged double-digit scoring last year. The hype is building around USC despite the program’s involvement in the FBI investigation. The Trojans have a team equipped to challenge Arizona for the Pac-12 title. Forwards Bennie Boatwright and Chimezie Metu are two of the conference’s top players, and USC showed last year what it’s capable when both of them are healthy. They knocked off Providence and upset SMU before falling just short against Baylor in the second round. This Trojans team is deep and experienced. If they avoid FBI-related eligibility issues, they’re a Final Four sleeper. The Gators were on the winning side on one of the best plays of last year’s NCAA Tournament, and they have the pieces for a deep run once again. Sophomore guard KeVaughn Allen has SEC Player of the Year potential and senior Chris Chiozza, the hero from March, will be one of the league’s best point guards. Rice transfer Egor Koulechov, Virginia Tech transfer Jalen Hudson and stretch-four Keith Stone will space the floor to give Allen and Chiozza opportunities to carve up defenses. That takes care of the offense, and because this is a Mike White-coached team, we know the defense will be among college basketball’s best. West Virginia is the only team in Division I with a defensive turnover rate of 25 percent or better in each of the last three seasons. The Mountaineers unnerve their opponents with defensive pressure led by seniors Jevon Carter and Daxter Miles Jr., arguably the two best perimeter defenders in the nation. They’ll need more offense out of Miles this year, and there’s some questions in the frontcourt. Junior forward Esa Ahmad will serve a suspension for the first half of the season, leaving sophomores Sagaba Konate and Maciej Bender to man the paint. Those guys can defend, but any offense the Mountaineers get from them will gravy. The defending champs got off with no punishment from the NCAA in their academic fraud case, which alleviates any distractions while they shoot for their third straight Final Four trip. Point guard Joel Berry II is back after winning Most Outstanding Player at the Final Four, but he’ll miss the start of the season because he got upset after losing a video and broke his hand on a door. But with three other key players from the championship team returning, including Elite Eight hero Luke Maye, and the addition of Pitt transfer Cameron Johnson, who can help fill Justin Jackson’s shoes, UNC will stay in the mix in the ACC. The Cardinals return one of the nation’s top point guards in senior Quentin Snider, and they’re deep on the wings with Deng Adel, V.J. King and UNC Asheville transfer Dwayne Sutton. Last season, Louisville was an average shooting team that thrived offensively thanks to ball control and offensive rebounding. Their turnovers should remain under control with Snider and Adel back, but they lost their two best offensive rebounders, Mangok Mathiang and Jaylen Johnson. Time for 7-foot Anas Mahmoud and 6’10” Ray Spalding to step up on the glass. While Rick Pitino is out of a job, his son Richard is just starting to build his legacy. The 35-year-old Pitino has his best team yet in five years with the Golden Gophers. They return five of their top six scorers, including preseason All-Big Ten selections Nate Mason and Amir Coffey. Junior forward Jordan Murphy could also work his way into the all-conference discussion, and senior center Reggie Lynch will be a leader in the league’s defensive player of the year race. While veteran returning players will populate the starting lineup, look for two key newcomers to contribute off the bench. Top 100 freshman Isaiah Washington will backup Mason at point guard, and fifth-year Texas A&M transfer Davonte Fitzgerald adds another veteran presence behind Murphy and Lynch. Purdue loses All-American forward Caleb Swanigan but returns the other six main players from last year’s team. Ultimately, that’s a trade off they’ll take as it keeps them in the running for a second straight Big Ten title. The Boilermakers will turn to senior wing Vince Edwards as their top option and expect much more production from 7’2″ senior Isaac Haas, a monster of a man who has been productive in limited minutes in the past. They also add 6’6″ guard Nojel Eastern, a four-star recruit who already threw down a monster jam in an exhibition game. It’s all about forward Bonzie Colson and guard Matt Farrell. The senior duo have the skill to carry Notre Dame into contention for the ACC title. Colson earned a All-American Third Team nod last year while averaging a double-double. Farrell finished second in the ACC with 5.5 assists per game, second only to lottery pick Dennis Smith Jr. They’re one heck of an easy duo to root for. The Fighting Irish have thrived on having several shooters on the roster in recent years. After losing Steve Vasturia, V.J. Beachem and Matt Ryan, they’re weaker in that area. That will put more pressure on Rex Pflueger and Temple Gibbs to space the floor. Saint Mary’s hasn’t won an outright WCC title since 2011-12, but this could be the year the Gaels top Gonzaga and end that streak. They return their top three players, including potential All-American center Jock Landale and lethal 3-point shooter Calvin Hermanson. They add another shooting threat in Ole Miss transfer Cullen Neal and have senior floor general Emmett Naar to run the show. Keep in mind they went 0-3 against the Zags last year and have lost four straight in the rivalry, though. Time to exorcize those demons. Coach Jim Larranaga was targeted in the FBI investigation, but he claims innocence. We’ll see if the Hurricanes can shake that distraction with one of the most talented rosters in program history. Adding five-star recruit Lonnie Walker to a backcourt with NBA prospect Bruce Brown and Ja’Quan Newton will make Miami extremely tough to guard. But there’s one caveat. Walker sustained a knee injury in July and missed most of the summer and fall leading up to his freshman debut, finally returning to practice two weeks ago. He’s played well in exhibitions and scrimmages, which is a promising sign. After nearly falling out of the NCAA Tournament field, Xavier turned around in the NCAAs and made a Cinderella run to the Elite Eight, shocking Arizona on a last-second shot in the Sweet 16 to Bill Murray’s delight. Trevon Bluiett and J.P. Macura were outstanding during that run while Sean O’Mara had a coming out party. If O’Mara builds on his postseason performances and becomes a legitimately imposing frontcourt presence, Xavier could find its way into the top 10 this season. Also look for some key contributions from sophomore center Tyrique Jones and Green Bay transfer Kerem Kanter. I’ve already taken a look at senior forward Angel Delgado and his potential as an All-American. But there’s more to Seton Hall than just Delgado and his relentless double-doubles, namely senior guard Khadeen Carrington and senior wing Desi Rodriguez. The Pirates have a balanced starting five with four players who averaged double-digit scoring last year. The only one who didn’t, senior forward Ismael Sanogo, is a glue guy and an elite defender. Seton Hall doesn’t have much depth, so getting quality bursts from junior forward Michael Nzei and sophomore guard Eron Gordon will go a long way. It’s not often you see a team lose four of its top five scorers and begin the next season in the top 25 without adding an insane recruiting class. But Mark Few always finds a way. The Zags still have plenty of talent, although no single player on the roster is as good as Nigel Williams-Goss or Przemek Karnowski. Senior forward Jonathan Williams, their top returning scorer and rebounder, gives them one of the best three-and-D players in the nation while senior guard Silas Melson and sophomore wing Rui Hachimura provide elite athleticism. Getting Josh Perkins to run the offense as well as Williams-Goss did is a must if Gonzaga is going to sniff consecutive Final Four berths. The Friars snuck into the 2017 NCAA Tournament by winning their final six regular season games but bowed out to USC in the First Four. With their top seven players back, they have a chance to build on that February push in 2017-18. Senior guard Kyron Cartwright is among college basketball’s best floor generals, posting a 41.9 assist rate last season. Senior forward Rodney Bullock gives the Friars a go-to scorer, but he’ll need a more efficient season if the Friars will live up to a top 25 billing. Bullock posted a 49.3 eFG% in 2016-17. Similar to Gonzaga, UCLA lost its top four scorers. Unlike Gonzaga, UCLA has a top-five recruiting class to replace them. Junior guard Aaron Holiday stands to be a breakout star for this team after averaging 12.3 points and 4.4 assists while five-star freshman Jaylen Hands will back him up at the point. Fellow five-star Kris Wilkes should step in as an immediate starter on the wing while seniors G.G. Goloman and Thomas Welsh, who both have range on their jump shots, man the frontcourt. This team probably won’t be as good as last year’s, and they definitely won’t be as exciting. But there’s potential nonetheless. Alabama was ahead of schedule in Avery Johnson’s second just by being in the bubble conversation. The problem was the Crimson Tide couldn’t score enough, even with a top 10 defense. That’s where freshman phenom Collin Sexton comes in. The five-star point guard can score a ton himself, and he and sophomore guard Dazon Ingram will team up for distributing duties. ‘Bama lost more than 30 percent of its offensive rebounding, one of its few offensive strengths in 2016-17. Look for Ohio State transfer Daniel Giddens to spend a lot of time crashing the boards. The Wildcats return four starters from last year’s historic NCAA Tournament team, including a pair of preseason All-Big Ten selections in senior guards Bryant McIntosh and Scottie Lindsey. While they lost two key seniors, glue guy Sanjay Lumpkin and shooter/Hail Mary specialist Nathan Taphorn, they have plenty of leadership with three seniors and two juniors among their top six players. As far as replacing Lumpkin’s rebounding and Taphorn’s shooting, look for junior center Dererk Pardon to eat on the glass and redshirt sophomore Aaron Falzon, who started as a freshman but missed 2016-17 with a knee injury, to stretch the floor.